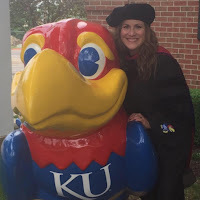 Early last Fall, I was answering to my doctoral committee on questions and issues in educational technology, focusing on what I had learned from my reading and research and on how I would put that all to use in constructing my research proposal and methodology. I was thrown when one of my committee members asked me what I had gained from working on my doctorate at KU. In the throes of coursework and networking, I had lost sight of exactly what I was doing and how it was all transforming me. You see, I always viewed this degree as an end…a sign that I had proverbially “made it” in terms of my education and academic career. Upon finishing, I would have time to breathe and relax and really take in the world around me. Just the opposite happened. I find myself reading and writing even more, partaking in synchronous and asynchronous discussions on a regular basis, elevating my need for information, and researching topics to transform my work and interactions. I see now why that committee member wanted me to reflect on my work at KU. So, Dr. Zhao, in a long-awaited answer to your question that you asked last October, my experience through this process has transformed me. I crave more quality and research-driven information. I’m constantly reading and researching, and my experience has made me entrepreneurial in the sense that I want to seek out the “why” of every issue I encounter. I feel a charge to change my world and that of others. I read journals and papers now with a renewed sense of critical inquiry and hope. Thank you for asking the question that has been stuck in my mind since it was asked. I thought I was getting a degree; instead, I gained a vision of who I truly am and why this journey was so incredibly important to me.